Arsenal on this day in history. The February Files. Note: The anniversary file pages have over time been split and split again as they have grown. Please use the index at the foot of the page to find the month you want. 1 February 1902: A possible date of birth for John “Jack” Lee. He played for a variety of non-league clubs in the north east before being signed by Arsenal as a possible left winger of the future. 1 February 1913 Arsenal 1 Liverpool 4. Crowd 8655 for this FA Cup match. Arsenal had drawn with Liverpool at home in the league in late December, but there was little hope by February of anything against the twice League winners. 1 February 1914: The main stand at Gillespie Road (Highbury) was reported in the press as having tarpaulin for walls as work continued. 1 February 1947: Arsenal 6 Man U 2. An extraordinary result given that Man U finished runners-up (Arsenal were 13th) and the match at Old Trafford ended 2-5. 1 February 1992: Arsenal 1 Man U 1 watched by 41,703 – the highest attendance of the season. It was Arsenal’s 7th consecutive game without a win. Rocastle scored. But from this date to the end of the season Arsenal were unbeaten in 17 including a 7-1 thrashing of Sheffield Wednesday (who finished the league in third) and a 5-1 over Southampton. 2 February 1898: Birth of Harry Storer Jnr. His father was the the first man to be forced out of Arsenal by the crowd, despite being the first Arsenal man to play in a representative match. Harry junior played for Grimsby Town, Derby County, Burnley plus twice for England. Like his father he played cricket for Derbyshire. He later became managed Coventry City, Birmingham and Derby to championships. 2 February 1927: Herbert Chapman exerted his authority against Sir Henry Norris for the first time in the George Hardy affair, having Hardy removed for countermanding Chapman’s pitchside instructions.. Tom Whittaker was promoted in his place, as the dynasty of Chapman, Shaw, Allison and Whittaker was secured. 2 February 1935: Alex James scored his only hat trick. Many reasons are given – perhaps because the opposition manager told his players not to bother about James because he never scores. Maybe because his son was boasting that he had just scored seven in a school game. Or because Allison announced he has just signed the “‘new Alex James”. 2 February 1957: Arsenal 6 Sheffield W 3. (Herd 3, Tapscott 2, Bloomfield). The first season in 20 years in which any club scored over 100 goals (both Man U and Tottenham did) while Arsenal who came 5th scored 85. In the following match Arsenal lost 2-6 to Man U. 2 February 1977: In a sign of the times the Newcastle United squad threatened to strike unless Richard Dinnis was appointed permanent manager. And player power won as the board agreed to the players’ demands and appoint Dinnis as manager. 2 February 1991: Arsenal lost their one and only league match of the season. Chelsea 2 Arsenal 1. It was match 23 of what turned out to be a dry run for the ultimate unbeaten season. The media did not seem to notice. 3 February 1919: Having honourably admitted that there were no precedents for the issue of extending the league Tottenham staked their claim to be re-instated in the First Division. Athletic News responded suggesting that Arsenal, Chelsea, Preston and Derby should get the four places up for grabs in the expanded 1st Division. 3 February 1934: A surviving Arsenal/Everton programme confirmed that the match represented a rare appearance of Alex James as captain. It ended Arsenal 1 Everton 2. After three losses and a defeat following Chapman’s death, it looked like the chase for the championship was over. It was also the last game for Ernest Coleman. He had been a brilliant player in the previous season with 24 goals in 27 games but this season scored just the once. 4 February 1919: Having just received the support of the prestigious Athletic News weekly in his campaign to get Arsenal elected to Division 1, Sir Henry Norris took his seat in the Commons for the first time with Lloyd George as Prime Minister, Bonar Law leader of the House, and J Austen Chamberlain the Chancellor. 4 February 1922, The Duke of York attended Arsenal 2 Newcastle 1. With Sir Henry Norris and William Hall unavailable, directors Jack Humble, Charles Crisp and George Peachey, did the honours. Leslie Knighton later alleged that Arsenal wasted money that could have been spent on transfers on champagne, not knowing the Duke did not drink. How many players could you buy for a bottle of fizz? 4th February 1954 25 years old Con Sullivan was signed from Bristol City as goalkeeping understudy to Jack Kelsey. 5 February 1921: Last game for Fred Pagnam: Sunderland 5 Arsenal 1. He had testified against his own team mates in the Liverpool/Man U match fixing scandal of 1915 – and comes over in history as a man of great honour at a time when every dirty trick possible was being pulled. 6 February 1915: Arsenal 2 Leeds City 0. Woolwich Arsenal and Chapman met at Highbury for the first time. Although Chapman was later accused of illegal payments to players during the war and banned for life, he was exonerated on appeal and returned to football with Huddersfield. It was Arsenal’s last game against Leeds City. 6 February 1926: Leeds United 4 Arsenal 2. Debut for Joe Hulme, who was thought at the time to be the fastest man in English football. Brain and an own goal for Arsenal. It was the third of three successive defeats after which Arsenal only lost three more all season. 6 February 1953: Brendon Batson born in Trinidad. He signed for Arsenal as an amateurin February 1969 but only made six starts and four sub appearances across three seasons before going on to Cambridge in January 1974. 6 February 1968: Arsenal beat Huddersfield 3-1 in second leg of League Cup semi final to reach their first cup final since 1952. It was the club’s first ever League Cup final. 7 February 1993: Crystal Palace 0 Arsenal 3. League cup semi-final 1st leg. Smith (2) and a penalty from Ian Wright. Cup match 10 of the Cup Double season. 8 February 1902: First game for Thomas Tindal Fitchie – the man who signed five times for Arsenal. Known as the prince of dribblers he signed for clubs seventeen times in his career as he combined being a salesman with being a footballer. 8 February 1905: Arsenal lost 0-1 to Bristol City (away) in the FA Cup in front of 10,000. City were on the way up and in the latter part of the decade were league runners’ up and cup finalists. 8 February 1913: Debut for Stephen Stonley who was signed from Newcastle City, having never played a league game. The selling club was probably in Staffordshire, and his signing either shows that Arsenal’s scouting system was widespread or that the player travelled to Woolwich looking for work. 8 February 1913. First match for Joseph Fidler – one of the men who played the last game in Plumstead and the first game at Highbury. The game was a goalless draw; Arsenal’s first point after four defeats. 8 February 1919: Arsenal played Chelsea at Stamford Bridge, and won 2-1 in the final season of the London Combination wartime league. The crowd however was only 12,000 as the weather and the flu epidemic took their toll. 8 February 1929: Up to this point there was uncertainty whether Lambert or Halliday was Arsenal’s best centre forward but a hattrick against Everton, following one earlier in the season against Grimsby seemed to settle the issue for Chapman. Lambert finished the season with 18 goals in 20 games. 8 February 1936: Last game for Frank Moss v Blackburn. Frank took over from Charlie Preedy in goal and was nearly ever present for four years playing in the title winning teams of the triple years (1932/3, 1933/4, 1934/5). 8 February 1940. By this date all the games in the wartime Football League South “A” Division for 1939/40 were played, save one – which for some curious reason was left until 3 April! 8 February 1947: First team debut for George Curtis. He did play in two of the league matches in the abandoned 1938/9 season but those are discounted. He played 11 games in 1946/7 before transferring to Southampton on 11 August 1947. 8 February 1941: Arsenal 15 Clapton Orient 2 (London War Cup, 10 goals for Leslie Compton). 8 February 1956: Leyton Orient manager Alec Stock publicly announced his intention to join Arsenal as assistant to Tom Whittaker. 8 February 1979: Brian McDermott became full professional (for his life in management see here). After management ending at the chaos of Leeds he returned to Arsenal as a scout. 8 February 1980: Rhys Wilmot turned pro. He played eight league games for Arsenal in goal and then later played for Hereford, Leyton Orient, Swansea, Plymouth, Grimsby, Crystal Palace and Torquay Utd. 8 February 1987: Arsenal 0 Tottenham 1; League Cup semi-final 1st leg. A defeat but the match became famous as the opening game in the sequence of one nil down, two one up games as Arsenal started to win things again. 8 February 1995: Milan 2 Arsenal 0 in Super Cup second leg after a goalless first leg. 8 February 1998: Arsenal 2 Chelsea 0. (Hughes 2). 25th league game of the 2nd Double season The second double: part 1, part 2, part 3. 8 February 2007: Mark Randall signed professional terms with Arsenal. He never hit the heights and drifted in the lower reaches of the Italian league before returning to England and playing with MK Dons. 8 February 2009: 350 days on from his horrific injury Eduardo was named as a sub for game v Tottenham. He did play again, but never reached his earlier standard. 8 February 2012: Johan Djourou signed a contract extension to 2015 but left before the end to go to Hanover, having played 86 games over a ten year period. He later moved on a permanent deal with Hamburg. 8 February 2014: The run of 6 wins and 2 draws in 8, since the 6-3 defeat to Man C ends with a 5-1 defeat to Liverpool. Arsenal were four down in 20 minutes. It was one of three big defeats (the third was the loss to Chelsea) which came to define the season. 9 February 1935: Even in the all-conquering 1930s there could be upsets. Birmingham were on a run of six defeats and three draws in the last ten and 19th in the League. But on this day beat Arsenal 3-0. 10 February 1894: Arsenal’s second ever league hat trick. Henderson got all 3 in defeat of Crewe on his way to becoming the top scorer for the season. Arsenal won 3-2 at home with a crowd of 4000. It was Walter Williams only game for Arsenal. 10 February 1906: Arsenal 2 Wolverhampton 1. Having won only six games all season Arsenal won nine of the next 10 to climb away from a relegation threat. 10 February 1909: Millwall Athletic 1 Woolwich Arsenal 0. (FA Cup replay). Despite being a midweek afternoon match over 16000 turned up. Added to the 32000 in the match at Woolwich the large crowds in previous cup matches the FA Cup helped Arsenal finances enormously. 10 February 1917: In the London Combination wartime league Arsenal got a 3-2 home win over Fulham with a crowd of 4800 in the ground, and snow on the pitch. In the press stories were starting to circulate about a shortage of coal and potential rationing. 10 February 1922: John “Alex” Mackie signed from Forth River Belfast – but contrary to most reports based on a false report from Arsenal manager Leslie Knighton he did not ask for a monkey as his signing on fee! 10 February 1927: Ben Marden born. He had only limited opportunities for Arsenal (playing 42 league games across five years) but played in the final game of the 1953 league winning season. 10 February 1934: After Chapman’s death Arsenal lost three and drew one game, but on this day returned to winning ways beating Middlesbrough 2-0 as they headed for their second successive title.Brikett and Bowden scored. It was Peter Dougall’s debut. See also here. 10 February 1948: Jimmy Rimmer born. He joined Manchester United on schoolboy forms in 1963 appearing 34 times in the league and 12 times in cup matches before being loaned Swansea City. In February 1974 he signed for Arsenal for £40,000, and in the three seasons from 1974 to 1977 he missed just three league matches. 10 February 1962: Birmingham 1 Arsenal 0, the fourth successive defeat effectively spelling the end of Swindin’s regime. Mel Charles’ last game. He wrote in his autobiography that signing for Arsenal was the worst choice he ever made. 10 February 1979: And then on the day after the first ever £1m transfer was announced (double the previous record) Arsenal played out a goalless draw on 10 February at Highbury with Middlesbrough. 28,371 were there and probably wished they had stayed in the warm. 10 February 1984: Gus Caesar became a professional. He went on later to work in the finance industry in Hong Kong, having finished his football career there. 10 February 1993: Arsenal v Wimbledon (Premier League). Attendance: 18253, with the ground capacity limited due to the closure of the north bank. Arsenal lost 0-1 in a sequence of 14 league games in which they scored just four goals. 10 February 1996: Nottingham Forest 0 Arsenal 1. For the second week running Bergkamp scored the only goal. It was only Arsenal’s fourth win in 14 games since 18 November when Arsenal lost 2-1 to Tottenham. 10 February 2001: Arsenal 1 Ipswich 0. (Henry). Arsenal were five points ahead of Liverpool despite Arsenal having sold Anelka, Overmars and Petit for £55m, but lost the next game 6-1 to Man U. 10 February 2002: Everton 0 Arsenal 1 (Wiltord) at the start of 13 a match winning streak, and as part of a 22 match unbeaten run. League match 26 of the 3rd Double season. 10 February 2004: Arsenal 2 Southampton 0. The 25th league game of the unbeaten season. Henry got both goals. 10 February 2010: Despite the previous games being a draw with Villa and two successive defeats to Chelsea and Man U, Arsenal beat Liverpool 1-0 and start run of six successive wins. 10 February 2015: A 2-1 home win over Leicester signalled the start of Arsenal’s revival with eight straight wins. Before the match Arsenal were sixth. Two matches later they were third, and six matches after that second. 11 February 1888: Contrary to reports, the first match at the Manor Field (later the Manor Ground) and home of Arsenal until 1913 was not on this day but was against Millwall Rovers on 30 March 1888. The game on this day against Millwall was played at the Sportsman Ground, Plumstead. 11 February 1893: Arsenal played Small Heath in one of over 50 friendly games in the season as preparations continue for possible entry into the Football League. The crowd of 3,000 was below average, but with the players now professional regular games were required to keep the money flowing in. Arsenal won 3-1. 11 February 1905: Debut of Andy Ducat v Blackburn. He won caps for football and cricket, and was eventually sold to Aston Villa in 1912 for £1000, as part of the cost-cutting measures as the club prepared to move to Highbury. 11 February 1920: Arsenal had the return game with Aston Villa, having lost 0-1 at home. And the result was just as disappointing away – Arsenal lost again 1-2. White got a penalty for Arsenal as they slipped down to 12th. 11 February 1922: Newcastle 3 Arsenal 1, the start of a five match losing streak in the league in which Arsenal scored just one goal. Arsenal ended the season 17th, the lowest position since rejoining the first division in 1919. 11 February 1933: Arsenal could only draw with Blackpool 1-1. Villa won, thus once again putting the pressure on Arsenal, being three points behind but still with one game in hand, But the main talking point was about the match in Merseyside in which Liverpool beat Everton 7-4. 11 February 1933: Last game for Horace Cope v Blackpool. Despite joining for over £3000 he fell out of favour with Chapman and by the time the trophies began he was mostly a reserve player. 11 February 1950: Arsenal 2 Burnley 0 in the Fifth round of the FA Cup en route to winning the competition. Dennis Compton and Reg Lewis scored. 11 February 1961: Last game for Len Wills v Cardiff. He played 195 times for Arsenal; his only league club. Reports suggest he later ran a sports shop in Southgate, Middlesex, and also worked in the hardware and DIY business. He lives now in retirement in Epping. 11 February 1978: Having seen a run of just two defeats since mid-October end with two consecutive losses in which Arsenal didn’t score, Arsenal drew away to Leicester with just 15,780 in the crowd. 11 February 1988: David Hillier became a professional at Arsenal. He went on to play 104 league games for Arsenal and scored two goals before moving to Portsmouth. 11 February 1992: Arsenal 1 Norwich 1 in front of 22,890 – the lowest attendance of the season. Rockets and flares were let off in protest against the Arsenal Bond scheme. This was the ninth game in a run of just one win, scoring four goals. 11 February 2012. Thierry Henry scored his final goal in his final match for Arsenal in the 91st minute, against Sunderland for Arsenal to win 2-1. Ramsey scored the other in a run of seven consecutive wins. 11 February 2013: Andre Santos loaned to Gremio in Brazil. He had come from Fenerbahçe but only played 55 league games scoring 10 goals for them. He went on to play 25 games for Arsenal. 12 February 1993: Benik Afobe born. After multiple loans and a bad injury, he finally came good with MK Dons and was transferred on to Wolverhampton Wanderers in early 2015 and then to Premier League Bournemouth one year later. 13 February 1892: The first ever recorded incident of a club song being sung at a football match. “Ta ra ra Boom de ay, The Arsenal’s won today.” There were 10,000 at Chatham of whom 3000 were Arsenal fans. Royal Arsenal won 2-3. 13 February 1893: Royal Arsenal beat Third Lanark as their final season moved into its last stages, prior to the creation of the limited company and the start of the club’s first Football League season the following September under its new name. 13 February 1915. Clapton Orient 1 Arsenal 0. Attendance 4,000. Arsenal’s last ever second division London derby. The low crowd was part of the decline in attendance numbers following the outbreak of war in 1914. 13 February 1926: In Chapman’s first season after one win in six, Arsenal beat Newcastle 3-0 to start run of just one defeat in nine as the club headed to its highest first division finish to date: second. 13 February 1932: Portsmouth 0 Arsenal 2 on the way to third cup final in six years after having reached not one FA Cup final between 1886 and 1927. Bastin and Hulme scored. It was Ray Parkin’s only ever FA Cup match for Arsenal. 13 February 1935: The death of Phil Kelso, the manager who took us to our first FA Cup semi-final. Having kept Arsenal in the first division, he moved to Fulham and kept them in the Second Division (avoiding the drop back into the Southern League) throughout his years in the club. The club did not acknowledge his passing. 13 February 1956: Liam Brady’s birthday. On his 17th birthday on 13 February 1973 he turned professional. His league debut was on 6 October 1973 when he came on as a substitute in a game against Birmingham. 13 February 1979: QPR 1 Arsenal 2, making it just 1 defeat in 16. It was Terry Neill’s best run during his time at the club as manager. Price and Brady got the goals. 13 February 1988: Lee Dixon’s first game. Arsenal 2 Luton 1. He played 458 league games for Arsenal between this date and 2002, scoring 24 league goals before his retirement. After eight games without a win this was the first of eight without a defeat. Arsenal came sixth in the league, and lost in the League Cup final… to Luton. 13 February 1995: John Hartson signed for Arsenal. He joined at a difficult time but still scored seven goals in his 14 league starts in the tail end of the season making him the second highest scorer (beaten only by Ian Wright). 13 February 1993: Arsenal 2 Nottingham Forest 0. FA Cup 5th round with Ian Wright scoring both, making it seven in four FA Cup games so far. It was Cup match 11 of Arsenal’s Cup Double year. 13 February 1999: Kanu’s first match v Sheffield U. The game which was replayed after a controversial goal when the ball was thrown back to Arsenal after a stoppage. He played 119 league games before leaving in 2004 for WBA. 13 February 2000: Arsenal 0 Liverpool 1, following a defeat to Bradford this game left Arsène Wenger admitting that the fight for 3rd spot would be tough. Arsenal ended up second. 14 February 1891. Arsenal beat Crusaders 1-0 in the London Charity Cup This was Arsenal’s second and final entry into what is a rather mysterious Cup competition, of which few details remain, and they were knocked out in the next round, after two replays, by Old Carthusians. 14 February 1912: Bryn Jones (whose transfer smashed the transfer record) born in Merthyr. He played for a variety of clubs including Merthyr Amateurs,Glenavon and Aberaman Athletic, before signing for Wolverhampton Wanderers in 1933 for a fee of £1500. 14 February 1920: Arsenal lost 3-0 to Oldham in front of 14,000. However results elsewhere meant Arsenal stayed in 11th – and mid table security was the target in the first year back in the 1st division. But Arsenal had lost four and won just one game in the last five and were in need of a change of fortune if they were to avoid slipping back towards division 2. 14 February 1925: The International Board experimented with the proposed new offside law in the Arsenal v Huddersfield Town game on this day and Chapman as Huddersfield manager used the new rule successfully to defeat Arsenal 5-0. It was Arsenal’s worst home defeat since 28 October 1893 when Arsenal lost to Liverpool by the same score. 14 February 1925: Dan Lewis dropped from the Arsenal team for first time. Herbert Chapman had a habit of dropping goalkeepers, but reinstated Dan in time for him to play in the 1927 Cup Final, where Dan made the mistake that led to Cardiff’s victory. 14 February 1927: Dan Lewis made his Welsh international début against England, two years to the day from his Cup Final disaster, subsequently winning two more caps for his country. 14 February 1931: Arsenal were top of the league and on on this day at home to Derby, secured that position winning 6-3, the goals coming from a Bastin hattrick, James, Hulme and Jack. 14 February 1970: Arsenal 0 Chelsea 3. Last senior appearance of Bobby Gould. He went on to play for West Bromwich Albion (then managed by Don Howe) and then Bristol City, West Ham, Wolverhampton (for a second time), and Bristol Rovers (as player coach), before moving into management. 14 February 1978: For the second leg of the League Cup Semi-Final 49,561 came to Highbury in the knowledge that the 1-2 defeat in the first leg should have given Arsenal a strong chance to reach Wembley. But Liverpool “used their long experience in two-legged affairs” (as the press would have it) or in common parlance played for a 0-0 draw, and got what they came for. 14 February 1989: Arsenal 2 France 0. Hayes and Smith scored. This friendly was part of the League’s attempt to rehabilitate English football with all clubs having been banned due to Liverpool fans’ behaviour in the European Cup Final. 14 February 1991: Herschel Oulio Sanchez Watt born. He never played a league match for Arsenal, and after half a dozen loan spells settled at Colchester. 14 February 1995: Glenn Helder signed from Vitesse Arnhem. After leaving football he admitted to attempting suicide because of his gambling addiction. In 2007 he served a prison sentence for threatening one girlfriend and abusing another. 14 February 1996: Arsenal 2 Aston Villa 2, league cup semi-final. Bergkamp got both goals. The second leg one week later was a goalless draw, and Arsenal went out. It was the nearest Rioch got to a trophy with Arsenal. 14 February 1997: John Hartson sold to WHU for £5m. He later set up a foundation to raise money to fight testicular cancer and became a pundit with BBC Radio. 14 February 2002: Kolo Toure signed for Arsenal from ASEC Mimosas for £150,000. He played 225 league games for Arsenal, before leaving for Manchester City. 14 February 2005: Arsenal 5 Crystal Palace 1, this was supposedly the first Premier League match with no Englishmen in the starting XI for Arsenal or any other team, wilfully ignoring the fact that Liverpool had played the FA Cup final of 1986 without a single player who could qualify to play for England. 14 February 2014: Chuba Akpom started a loan deal with Coventry. He joined Arsenal aged six, and at the age of 19 started to make first team appearances as a centre forward. In 2015/6 he went on loan to Hull and hit a hattrick in the 4th round FA Cup match that took Hull through to an appearance against Arsenal, in which he could not play. 15 February 1890 Arsenal played Chatham away and won 5-0 en route to winning Kent Senior Cup for the one and only time. Arsenal’s nemesis, Royal Ordnance Factory FC won it in 1893/4. 15 February 1896: Goalkeeper’s William Fairclough’s first game. He played for Woolwich Arsenal between 1895 to 1897 making 27 league appearances. 15 February 1897 Jimmy Boyle captained Woolwich Arsenal in a friendly against Celtic, his last match before a transfer to Dartford. 15 February 1907: The Kentish Independent reported the explosion at the Manor Ground, saying the refreshment bar behind Spion Kop was “a dreadful wreck”. 15 February 1910: The Woolwich Gazette ran a cartoon with a character “Gunner” presenting the referee with the FA laws of the game, whilst the Rover goes off with his bag of “2 offside points”. 15 February 1913, Archie Devine’s first game for Woolwich Arsenal away to Chelsea which ended 1-1. He had transferred from Bradford City, but only lasted the one season. The game was one of a sequence of 28 in which Arsenal either failed to score or just scored one goal. Arsenal had also won only one of the previous 26 league games. 15 February 1919: Pitches in football grounds had not been attended to during the war, although matches continued, and their conditions declined. Highbury seemed to suffer a lot through poor drainage, and constant rain following a thaw at this time left the pitch as a mud heap and much of London flooded. Nevertheless 16,000 saw Arsenal win 4-0 to leave the club second in the London Combination, six points behind Brentford. 15 February 1930: Middlesbrough 0 Arsenal 2 in the fifth round of the FA Cup as Arsenal moved towards the club’s first major trophy. Lambert and Bastin scored. 15 February 1934: Henry “Jimmy” Bloomfield was born. He played initially for Hayes before moving on to play for Brentford in 1952, but when the club were relegated from Division II into Division III South in 1954 he moved to Arsenal for £8000. 15 February 1975: Arsenal 0 Leicester City 0, 43,841 in the 5th round of the FA Cup. Jeff Blockley returned to Highbury where he was so disliked by some in the crowd, and inevitably never put a foot wrong throughout the game. 15 February 1977: Middlesbrough 3 Arsenal 0, and an attendance of 26,083. In the last four league games Arsenal had scored nil, let in six, won nil, drawn one and lost three. Quite how this could be in a team that included Stapleton and Macdonald was simply beyond belief. 15 February 1983: Arsenal 2 Man U 4. League cup semi final 1st leg. Nicholas and Woodcock scored. Man U also won the second leg 2-1. 15 February 1992: After just one win in the last seven Arsenal beat Sheffield W 7-1. Even more amazingly, Arsenal had scored just four goals in the previous nine games. Campbell and Limpar each got two. Sheffield W finished the league in 3rd! 15 February 1998: Arsenal 0 Crystal Palace 0. FA Cup 5th round on the way to the 2nd Double. The second double: part 1, part 2, part 3. 15 February 2003: Manchester U 0 Arsenal 2 (FA Cup 5th round). This was the game in which Ferguson, in a fit of rage, kicked a football boot in the changing room and it hit David Beckham. 15 February 2007: HRH Queen Elizabeth became the first monarch to entertain a football team at Buckingham Palace and Arsenal the first team to visit. On 26 October 2006 the Duke of Edinburgh had opened the Emirates Stadium but the Queen had been unable to attend – hence this invitation. 15 February 2012: Milan 4 Arsenal 0 in the Champions League. Arsène Wenger was visibly annoyed by the performance of his team. Arsenal went out in the end but the replay showed a remarkable fighting spirit. 15 February 2013: David Bentley went to Blackburn on loan from Tottenham as his career appeared to enter its final stages. Upon retirement to open a restaurant he said that he had “never felt like a footballer”. 15 February 2015: 85 years to the day after Arsenal beat Middlesbrough on the way to their first trophy, two goals from Giroud saw Arsenal sail through the fifth round of the FA Cup against Middlesbrough, and hopes began to develop that the club might retain the FA Cup, something it had only ever done once before. 16 February 1886: Andy Ducat born. It was his transfer from Arsenal after 175 league games that signalled that the club would sell any player in order to try and survive financially. 16 February 1889: Woolwich Arsenal beat dreaded local rivals Millwall Rovers for the third time in six games, but the score is lost to history – a reminder that it was only through joining the League that the club ensured all details of its history were kept. 16 February 1907: Tim Coleman’s sole appearance for England. He was one of a number of players who came to Arsenal via Kettering Town – although he first moved to Northampton Town. 16 February 1918: Arsenal’s time in the war time league was very much an up and down affair – largely dependent on who was available. On this day a 3-0 away win over QPR, meaning that Arsenal had just won its last two away games scoring 7 conceding one while in between losing at Highbury 0-3. 16 February 1935: Despite being top of the league, the defeat to Birmingham in the previous match convinced the press that Arsenal would slip up against Reading of the 3rd Division in the FA Cup 5th round – even though Reading had not played any 1st division teams so far. The press were wrong, Arsenal won 1-0 with a goal from Bastin. 16 February 1938: Arsenal 2 Manchester City 1 in which Eddie Carr replaced Leslie Jones at inside left. Carr wasn’t thought worthy of holding his place but when he did get a chance he scored seven times in the eleven games including five in the last three games, when the championship was up for grabs between three clubs. 16 February 1955: Arthur Milton sold to Bristol City. A most relaxed, down to earth man he was the last of the twelve men ever to play international football and test cricket for England. He married the daughter of his landlady while at Arsenal. 16 February 1957: Bournemouth of Division 3 (south) managed by ex-Arsenal man Freddie Cox, beat Tottenham Hotspur 3-1. Aside from the League Cup and a friendly Bournemouth had to wait until 2015 to play Arsenal. 16 February 1980: Bolton Wanderers 1 Arsenal 1 in the FA Cup, with 23,530 in the crowd and a pitch (and very quickly the players) totally covered in mud. The only tactic was to boot the ball as hard as possible in vaguely the right direction. 16 February 1991: Tony Adams played his first game for Arsenal upon release from prison – a reserve game in front of 7000 having been immediately rehabilitated into the club. 16 February 2002: Arsenal 5 Gillingham 2. FA Cup 4th round. (Kanu, Adams, Parlour and two for Wiltord). Part of the 3rd Double season. 16 February 2008: Man U 4 Arsenal 0 (FA Cup 5th round). The match was followed by a run of five league games without a win. 16 February 2009: Eduardo played his first game after injury, in a game against Cardiff, and scored twice. Bendtner and Van Persie got the other two as Arsenal won 4-0; all the more remarkable as it came in the midst of a run of four 0-0 draws in the league. 16 February 2011: Arsenal 2 Barcelona 1 – a match which raised the hopes of a return to form for Arshavin, who scored. Van Persie got the other. 16 February 2013: Arsenal 0 Blackburn 1. FA Cup Round 5. Blackburn had one shot; the referee was Mike Dean and his performance was considered somewhat “unbalanced” by some commentators. 16 February 2014: Arsenal 2 Liverpool 1. FA Cup Round 5. Arsenal continued on their way to Cup victory and the end of the dearth of trophies since moving to the Emirates Stadium. 17 February 1902: 1000 spectators saw Arsenal beat QPR in the London League Premier Division. But even though crowds were always low for these games, any income was worth having. 17 February 1906: Jimmy Ashcroft became Arsenal’s first England international. He played over 270 league games for Arsenal and three games for England. 17 February 1906: Hugh McDonald’s first game. He became so highly rated for Arsenal that he was picked to play in goal even when so badly injured that he could not even jump for the ball. 17 February 1917: It was a measure of how rapidly football fortunes changed in the wartime London Combination that on this day Arsenal won against Chelsea 3-0; a year before Chelsea had been all-conquering. 7,500 turned up, which given the bad weather and the number of men now serving in the army, was a decent turnout. 17 February 1932: There are few occasions when one could call Grimsby the 1st Division’s “in form” team but they had just had two wins and a draw, and their last match before facing Arsenal was a 5-1 win against Liverpool. But it is was Arsenal’s form that was maintained with a 4-0 victory which took the club up to third place. 17 February 1936: Joe Haverty born. He played for Home Farm FC and St Patrick’s Athletic in Ireland (reaching the country’s Cup final), and then signed for Arsenal in 1954. At 5 feet 3 inches he was one of the smallest players ever for Arsenal. “Use your height Joe” was shouted from the crowd in every match he played. 17 February 1940: The movie of the “Arsenal Stadium Mystery” novel released. The book remained the only Arsenal novel published until “Making the Arsenal” in 2010. George Allison, the man who had been the lead commentator for BBC football matches, says, in the movie, “One nil to the Arsenal”. 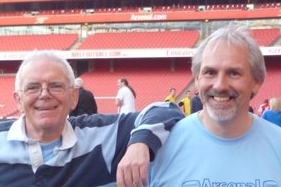 17 February 1971: Man City 1 Arsenal 2 (FA Cup round 5). Charlie George upon his return to the side from injury got both goals to take Arsenal forward in the first Double season. See also here. 17 February 1999 : Arsenal conceded their first goal in two months (including six league games) in what was also Kanu’s first league match. The final score was Man U 1 Arsenal 1. Anelka scored Arsenal’s goal. 18 February 1888: Arsenal v Erith – continuing the development of Royal Arsenal through the club’s first full season. This is the first recorded appearance of Jack Humble in the team, although for a number of games in this era there are incomplete details. 18 February 1901: Leonard Thompson was born in Sheffield. He played 26 games for Arsenal and provides one of many examples of how utterly unreliable Bernard Joy’s book on Arsenal is as a source. Joy called him the “penalty king” but in fact he only ever took two penalties! 18 February 1911: Blackburn 1 Arsenal 0. The result meant that Harry Logan had played seven games for Arsenal in the league, and the club had not won any of them. 18 February 1939: Gordon Bremner was one of the many extraordinary footballers who could never develop his talent because of the war. Arsenal 1 Chelsea 0 was his 7th league game in succession in which Arsenal won six drew 1 and did not concede a single goal. 18 February 1953: Arsenal 6 Derby 2, giving 24 Arsenal goals in six games. Despite losing two of the next three, Arsenal continued to progress to the title. Daniel (2), Holton (2), Lishman (2). 18 February 1956: Dennis Evans went in goal when Jack Kelsey was injured in a 5th round FA Cup replay against Sheffield United. Arsenal lost 0-3. 18 February 1958: Last game for Derek Tapscott. He played 132 league games for Arsenal, before moving on to his home club Cardiff City. After retirement from football he worked in the sporting goods trade for Gola and wrote his autobiography, Tappy. 18 February 1961: League debut for David Bacuzzi, taking over at full back from Len Wills who was injured. He ultimately played 46 league games for Arsenal. Arsenal beat WBA away 3-2, the first win in four, Haverty (2) and Skirton getting the goals. 18 February 1965: Terry Anderson transferred to Norwich after just 25 games. He went on to play 236 games for Norwich where he stayed until 1974. In 1980 Terry was seemingly on a training run in Great Yarmouth, and never returned. His body was found a week later – tragically he had drowned. 18 February 1969: Arsenal 0 Ipswich 2 made it two defeats, one draw, one win in the last four games, as Arsenal slipped to fourth in the league after the long winning run earlier in the year. 18 February 1976: Derby County 2 Arsenal 0, with 24,875 in attendance. The result meant that Arsenal were now 18th and looking increasingly like relegation contenders. 18 February 1984: Debut for Paul Mariner. He played 60 times for Arsenal and 35 times for England. It ended Arsenal 1 Aston Villa 1 (Rix scoring). It was Arsenal’s sixth consecutive game without a win. 18 February 1986: John Devine broke his leg – an incident that ended his top flight career. He later moved to Norway as a player before returning to England and moving into coaching. 18 February 1987: Tony Adams’ international debut. He played 66 times for England, as well as 15 England “B” games, and five games for England under 21s. 18 February 1989: Millwall 1 Arsenal 2 concluded a 10 match unbeaten run including eight victories. Since their early rivalries both clubs had moved across the river – Millwall south to the Den, Arsenal north to Highbury. 18 February 2001: Arsenal 3 Chelsea 1. FA Cup 5th round, on the way to the final. Henry and Wiltord scored to take Arsenal on to a game against Blackburn. 19 February 1910: Old Trafford was opened for its first game. 19 February 1910: Woolwich Arsenal played Fulham in a friendly, both teams having been knocked out of the FA Cup in the previous round and so not having a match. The event probably came about because of Henry Norris’ growing interest in the problems in Plumstead. 19 February 1916: Bob Benson died aged 33 during a wartime game at Highbury after he had arrived as a spectator but was persuaded to play as Arsenal were a man short. 19 February 1927: Arsenal 2 Liverpool 0 (FA Cup 5th round) on the way to the club’s first ever FA cup final. Although Arsenal lost in the final, this was a pivotal period in the club’s history and prepared the way for the great successes of the 1930s. 19 February 1930: Derby 4 Arsenal 1. Arsenal only won four more league matches in the rest of the season and eventually ended the season in a disappointing 14th, but results included an 8-1 win and a 6-6 draw. But they were distracted by reaching their second cup final. This was the league debut for Albert Humpish. 19 February 1936: Arsenal 3 Newcastle 0 in the FA Cup 5th round replay, on the way to Arsenal’s second FA Cup triumph. Bastin (2 pens) and Beasley got the goals. 62,391 turned up – remarkable for a midweek game. 19 February 1938: Arsenal 2 Chelsea 0 made it four straight wins on the way to winning the league again. Griffiths and Drake scored. 19 February 1948: Alex Forbes signed from Sheffield Utd. He went on to play 240 league games for Arsenal before injury problems forced him to move on to Leyton. 19 February 1955: First Arsenal game for David Herd, a 1-1 draw against Leicester. He scored 97 goals in 166 games for the club before leaving in 1961. 19 February 1957: Centre half Bill Dodgin scored the opening goal for Arsenal in a 2-1 win over Preston North End in a 5th round FA Cup tie at Highbury, the only goal he scored in the whole of his professional career. 19 February 1972: Ipswich 0 Arsenal 1 made it four successive wins and 12 games without defeat as hopes were raised that last season’s double might be repeated. Charlie George got the goal. 19 February 1975: Leicester 1 Arsenal 1 – FA Cup replay. Although only a fifth round tie it was Arsenal’s sixth game in the competition that season. John Radford scored, as he did in the second replay to take Arsenal through. Also on this day WHU played Liverpool, and the away team only took 14 fans to the game. The media saw this as a sign of the end of football. 19 February 1977: Arsenal 2 West Ham 3. Although it was the sixth consecutive game without a win there was a little comfort taken from the fact that Arsenal had scored, after four games without a goal. Brady and Stapleton got the goals. 19 February 1994: Everton 1 Arsenal 1, making it five draws in a row: two at 0-0 three at 1-1. Merson got the goal. 19 February 2008: Arsenal 0 Milan 0. The result made progress into the quarter final of Champions League look unlikely and the press were, as always with Arsenal, seriously unimpressed. 19 February 2010: Gilles Sunu loaned to Derby, where he played nine games before a further loan to Lorient before signing for them permanently. He stayed with Lorient until 2014, before moving on second division Evian. 19 February 2013: Arsenal 1 Bayern Munich 3 suggested to the media that Arsenal were just not good enough at this level. 19 February 2014: One year on from losing 1-3 at home to Bayern Munich Arsenal lost again, this time 0-2 in the Champions League round of 16. 20 February 1897: Woolwich Arsenal 3 Burton Swifts 0. After four defeats and a draw, Arsenal recorded a win that was particularly welcome having lost the previous game 6-3. 20 February 1899: William Elcoat, Arsenal’s fifth most successful manager in the all time records, left the club claiming that he was having difficulties working with the club’s board of directors. 20 February 1904: Arsenal lost 0-2 in 2nd round of FA Cup to Man City in front of 30,000 spectators. However the main focus continued to be that of getting one of the two promotion spots. Arsenal were third, one point behind Burnley but with three games now in hand. 20 February 1909: A run of just two wins in 11 games ended with Arsenal beating Liverpool on this day, 5-0. 20 February 1915: Arsenal were away to Blackpool, and managed to come back from the recent poor results to score a 2-0 win. It was probably the first time Arsenal played in a warzone, Germany having announced two days earlier that it considered all the waters around the British Isles to be just that. 20 February 1926: Dr Jimmy Paterson played both in the game this day against Aston Villa away, and on 24 February for the replay at Highbury in front of 71,446 – a game which Arsenal won 2-0, with Paterson scoring the first goal. This is important in Arsenal’s history since it relates to one of the issues about which Knighton later libelled Henry Norris. 20 February 1932: Arsenal 2 Blackpool 0 making a perfect February of five league and cup wins. Jack and Parkin scored with 39,045 at Highbury. 20 February 1933: The Management Committee of the Football League finally gave Arsenal permission to wear shirts including “white collars and cuffs.” In this era all colour changes had to be formally approved. But Arsenal waited until 4 March to play in the new shirts. 20 February 1935: First game for Bobby Davidson. He played against Arsenal in the friendly at Muirton in September 1934 and was selected for the Scottish League team against the Irish League a few weeks later. Arsenal were at home to Stoke who had topped the table briefly earlier in the season, but were now lying fourth. Arsenal won 2-0 to stay top. 20 February 1950: Peter Marinello born. Despite all the hype surrounding his arrival he only played 38 league goals for Arsenal and scored just three goals. After Arsenal he had seven other clubs before retiring. 20 February 1971: Arsenal 3 Ipswich 2. Match 28 of the first Double season. George, Radford and McLintock scored, 39,822 in the crowd. 20 February 1998: Death of George Male aged 87. He joined the club in 1929 and finally left in 1975, having spent more than half his life at Arsenal. 20 February 1999: First hat trick for Anelka v Leicester. Arsenal won 5-0, in what was part of a 19 match unbeaten run. After the game Arsène Wenger said to Bergkamp he had never seen anyone play so well without scoring. 20 February 2002: Gilberto scored Arsenal’s fastest goal (v PSV) in the Champions League. It was timed at 20.07 seconds..
20 February 2007: Kevin Campbell’s last game as a footballer: Cardiff v WBA. After leaving football he moved into the security business. 20 February 2011: Leyton Orient 1 Arsenal 1. FA Cup 5th round in front of 9,136. Rosicky scored and Arsenal won the replay. 21 February 1899: Arthur Kennedy became Woolwich Arsenal secretary manager. He also served as club finance secretary, vice-chairman and was also the first man to write a formal history of the club. 21 February 1914, WA Spittle’s last game (away to Lincoln). We lost 2-5 and Spittle was thus never on the winning side for Arsenal. 21 February 1933: Daily Mirror reported the “sensation” of Arsenal’s new strip. Although the club had changed its strip regularly in the early days this became a big news story because of Arsenal’s success in the last three years. 21 February 1934: With Arsenal and Derby fighting it out at the top of the league, Arsenal went top with a 2-1 win over Blackburn. Blackburn had won four in a row in January, beating both Tottenham and Derby in the run. After losing to Sheffield Wednesday they beat Manchester City, making it five league wins in six games. 21 February 1939: Arsenal lost 2-1 away to Grimsby. Gordon Bremner played for Arsenal and it was the first game in eight where he played and Arsenal lost. Of the previous seven, six had been wins and one a goalless draw. 21 February 1962: Rhys Wilmot born. He only played eight times for Arsenal but went on to success with Plymouth and later became their goalkeeping coach. 21 February 1964: Defender Laurie Brown was sold to Tottenham – he played against Arsenal the following day – but amazingly was put into the team as Tottenham’s centre forward. 21 February 1970: Derby 3 Arsenal 2. 10 league games without a win. This moment – and the subsequent triumphs of 1970/1 – showed perhaps more than any other how fast things have always been able to change in football. 21 February 1976: With Arsenal in 18th and Birmingham in 19th position the match between the two was considered a crunch relegation battle. Fortunately it ended Arsenal 1 Birmingham City 0 with 20,907 in the crowd. 21 February 1995: George Graham was relieved of his duties having been found guilty of accepting an illegal payment in relation to transfer activities. He left the club in 11th position, 23 points behind the league leaders of the day and already out of the FA Cup. 21 February 1995: Stewart Houston became caretaker manager for the first time. He remains the only man in Arsenal’s history to manage the club on two separate occasions. He later worked with George Graham at Tottenham, was first team coach with Walsall, and later a scout for Arsenal. 21 February 1995: Debut for Glenn Helder. With Graham banished Arsenal finally won for first time in eight. Helder went on to play 39 times for Arsenal and scored one goal. 21 February 1996: Aston V 0 Arsenal 0; league cup semi-final 2nd leg after 2-2 at Highbury. Arsenal thus exited the cup. 21 February 1998: Arsenal 1 Crystal Palace 0, making it seven consecutive games undefeated. Arsenal were then nine points behind Man U with two games in hand after the 26th league game of the 2nd Double season. The second double: part 1, part 2, part 3. 21 February 2004: Chelsea 1 Arsenal 2. The 24th league game of the unbeaten season. Vieira and Edu scored in reply to Guðjohnsen’s first minute opening. Guðjohnsen was subsequently sent off. 21 February 2006: Despite gloom among supporters after a poor run of league form Arsenal beat Real Madrid 0-1 away in the Champions League – the first English club to win there. Henry scored – although in the next league match the poor form continued. 21 February 2009: Arshavin’s debut coming on as a substitute to replace Carlos Vela on the hour. The result was Arsenal 0 Sunderland 0, one of five consecutive draws for Arsenal in the league. 21 February 2015: Crystal Palace 1 Arsenal 2. Having been 8th in the league after 12 games, Arsenal climbed to 3rd after 26 games. Cazorla and Giroud got the goals. It was the second of eight consecutive league wins for Arsenal. 22 February 1910: George Hunt born. He was one of the team that won the league in 1938 and also as the first ever player to move from Tottenham (then of the second division) to Arsenal (about to become champions). 22 February 1913: Gillespie Road named in the press for the first time as the site of the new ground. There had been rumours for weeks that the site would be somewhere in Islington, but no one quite knew where. 22 February 1919: The English league debated the size of the league for the forthcoming season and recognising the sentiment of the day, voted for 22 clubs in each League with the recommendation that Chelsea FC should be elected into Division One despite their relegation in 1915 – in recognition of the fact that they had suffered from the match fixing antics of Liverpool. 22 February 1930: Not all Chapman purchases turned into masterstrokes, and Albert Humpish was one that failed. In all he played 3 league games, or which the second was Grimsby 1 Arsenal 1 on this day. 22 February 1936: Having signed as an amateur in April 1931 and as a professional on 9 May that year Sidney Cartright made his debut on this day against Portsmouth. Arsenal lost 2-3 to make it just two wins in seven. 22 February 1947: Stoke 3 Arsenal 1. Ronnie Rooke made it 11 goals in 8 games. This was part of a run of just one win in six. 22 February 1964: Tottenham 3 Arsenal 1, start of seven game sequence without a win – a run that suggested that manager Billy Wright did not know how to rectify the situation. He did however last until the end of the following season. Laurie Brown, signed by Tottenham from Arsenal the day before, played for Tottenham. 22 February 1992: Tottenham 1 Arsenal 1, As a result Arsenal were 6th, 18 points off the top of the table although they climbed back to fourth and cut the game to 10. Ian Wright got the goal. 22 February 1997: Nic Anelka arrived from PSG for approx £250,000. The story is that PSG did not want to sell him, but Arsenal arranged the signing on a technicality. He was later sold for 100 times the cost to Arsenal. 22 February 1998: The death of George Male. Arsenal was his only professional club and he played 285 games for the club. 22 February 2003: Manchester City 1 Arsenal 5. Arsenal went four up in 19 minutes in the 11th match of a 12 match unbeaten league run. It was Arsenal’s last game at Maine Road. Alex Ferguson ordered the radio on the Man U bus to be switched off as they drove to their match (according to the Guardian). 23 February 1895: Arsenal played Burton at New Brompton’s ground following the forced closure of Manor Ground because of crowd trouble. Arsenal won 3-0 in front of 5000 fans and it has been noted that no other club was ever treated so harshly for similar offences. 23 February 1901: Arsenal’s first ever match in the 2nd round of the FA Cup, and only their second appearance in front of 20,000 spectators. It ended Woolwich Arsenal 0 WBA 1. 23 February 1903: John “Alex” Mackie born in Co Antrim. He and started out at Monkstown and Forth River in Belfast, before being spotted (along with Andy Kennedy and Joe Toner) in 1922. Alex is the man who has become best known for the notion that upon signing for Arsenal he demanded a signing on fee of a monkey. He didn’t but may have used his signing on money to buy a monkey. He played 108 league games for Arsenal but never scored a goal. 23 February 1907: Arsenal 1 Bristol Rovers 0 in front of a crowd of 22,000 on the way to the semi-final, for the second year running. 23 February 1913: Tottenham supported by Clapton Orient called for a meeting of the League Management Committee to prohibit Arsenal’s move north. However the League reiterated their statement of 1910 that nothing in the rule book controlled where a club played its home games. Tottenham were in effect demanding the League change their rules, to suit Tottenham. 23 February 1918: Arsenal got their biggest war time league win – 7-1 at home to Clapton Orient. 4000 people saw the game. 23 February 1920: The Islington Daily Gazette criticised Arsenal’s recent performances, suggesting that with the large crowds the club had they could afford to buy better players, particularly levelling criticism at … the forward line! It was, it seems, ever thus. 23 February 1920: Winston Churchill as War Secretary, signed off the work of Sir Henry Norris as chairman of the committee overseeing the return of conscripts to civilian life, bringing to an Norris’ enrollment in the army. He left with the rank Lt Colonel. 23 February 1935: Arsenal away to Manchester City (who were third, three points behind Arsenal with a game in hand and an impressive home form of 10 wins, three draws and one defeat in 14) drew 80,000 fans – over double City’s average for the season. It ended 1-1. 23 February 1952: Arsenal 3 Leyton Orient O (FA Cup fifth round), heading towards another FA Cup final. Lishman got two and Lewis the other. 23 February 1957 Left back Dennis Evans missed the 2-0 home win over Everton and ended a remarkable run of 103 consecutive league and FA Cup appearances. 23 February 1965: Joe Baker scored Arsenal’s 100th league goal against Tottenham in this 3-1 victory in front of 48,367. Baker also got a second goal and Radford the other. 23 February 1980: Arsenal played Bolton Wanderers for the third match in a row, and won 2-0, with only 24,383 in the crowd and Vaessen making a rare appearance, coming on as a sub for Rice. The pitch was an unplayable mud heap. 23 February 1983: Man U 2 Arsenal 1: Milk cup semi-final 2nd leg. Man U had won the match at Highbury 2-4, and so Arsenal’s progress was always very unlikely. Raphael Meade got the goal. 23 February 1989: Rhys Wilmot signed for Plymouth for £100,000. He had played just eight games in nine seasons for Arsenal, but had played 71 league games while out on loan. 23 February 1997: Arsenal 0 Wimbledon 1 – the 4th game in a row without a win and with just one goal scored. 23 February 1999: Replay of the Sheffield Utd match following the controversial goal – the result was once again 2-1 but this time tickets were half price. Overmars scored (as he did in the first game) and Bergkamp got the second. 23 February 2000: Death of Dennis Evans. He played 189 times for Arsenal – his only football club. Dennis stayed on at Arsenal after his playing days as a youth and reserve coach, and then moved to Luton Town in a similar position, before leaving football to become a chauffeur. 23 February 2008: Birmingham 2 Arsenal 2. The day that robbed Arsenal of the title as Eduardo’s leg was broken. He never recovered his amazing potential and Arsenal won just one of the next seven. Walcott scored both goals. 23 February 2008: The Aliadière scandal in which the player was sent off wrongly and had his sentence increased on appeal. It revealed just how corrupt (or erratic depending on your point of view) the English refereeing system had become. 23 February 2010: Benik Afobe signed professional contract amidst reports that Barcelona wanted him. He eventually moved to Wolverhampton and then Bournemouth. 23 February 2013: Arsenal 2 Aston Villa 1 made it three league wins out of three and left Arsenal four points behind Tottenham. Cazorla got both goals, Diaby got a yellow card. 23 February 2013: The loyalty code: Mancini (then manager of Man C) criticised Nasri for “resting on his laurels”. Nasri then verbally attacked his manager but on 16 May said he was sad to see him go. 24 February 1892: Royal Arsenal attempted to form the Southern League. Arsenal eventually gave up on the scheme after some clubs were persuaded to pull out having voted to join, and instead Royal Arsenal joined the Football League 18 months later as Woolwich Arsenal. 24 February 1894: Middlesbrough Ironopolis 3 Arsenal 6. After taking 18 games to win 6, Arsenal completed a run of four wins in a row, en route to six wins and a draw in seven. It was the club’s first nine goal game, and the first time Arsenal scored 6 in a league match. 24 February 1902: Millwall 2 Arsenal 1, London League Premier Division. The rivalry between the two clubs continued; however only 3000 turned up as the game was played on a Monday afternoon. 24 February 1913: A director from each of Tottenham and Clapton Orient went uninvited to the scheduled meeting of the Football League management committee to ask them to prevent any move by Woolwich Arsenal to north London from going ahead. 24 February 1917: A 2-0 away win over Southampton with 3,000 present meant that out of the last 12 games Arsenal had won eight, drawn three and lost one. It was a tremendous improvement on the first part of the season. 24 February 1926. Arsenal 2 Aston Villa 0 in front of 71446 in the FA Cup 5th round replay. It was the biggest crowd thus far at Highbury despite just two wins in the last six league games. Jimmy Patterson, the player manager Knighton denounced as the brother in law of the physio played his second game. 24 February 1951: Jack Kelsey debut against Chelsea, and he let in five. But he returned and eventually became one of the all-time favourites at the club. 24 February 1959: Last game for Peter Goring. First league games for Peter Goy and the first and last game for Roy Goulden in a 1-0 victory to keep Arsenal top of the teague. Herd got the goal. 24 February 1962: George Armstrong played his first Arsenal game, v Blackpool. He went on to play exactly 500 league games for Arsenal before moving to Leicester. 24 February 1964: William Garbutt – the man who took football to Italy, died. He played for Woolwich Arsenal before managing Genoa, Roma, Napoli and Milan and is still celebrated as the founder of Italian football. 24 February 1968 Jim Furnell’s last game, against Manchester Utd. Arsenal lost 0-2, one of nine consecutive games without a victory during which Arsenal scored just five goals. After playing he went into coaching at Plymouth and later Blackburn. 24 February 1973: Arsenal 2 Carlisle 1. Ball and McLintock scored. FA Cup 5th round. After beating Chelsea Arsenal eventually lost in the semi-final to Sunderland. 24 February 1975: Leicester 0 Arsenal 1 (Radford). FA Cup 5th, 2nd replay. Arsenal had thus taken seven games to get through three rounds. 24 February 1976 The crowd of 36,127 was a considerable improvement on recent attendances and the result of Arsenal 1 Liverpool 0 was unexpected, not least because for the first time in this season Arsenal managed consecutive victories. 24 February 1979: Arsenal 0 Wolverhampton Wanderers 1. Attendance: 32,215. Arsenal were second and Wolverhampton were 15th having won one, drawn one and lost ten of their away games in the season. 24 February 1988: Arsenal 3 Everton 1. Thomas, Rocastle and Smith scored to secure a place in the league cup final, which Arsenal unfortunately lost to Luton. 24 February 2009. Arsenal 1 Roma 0 did not look to be enough in the Champions League to allow Arsenal through to the next round. Van Persie got the goal, but after an identical result in Rome, Arsenal went through on penalties. 25 February 1886: Wally Harding born in Greenwich. Aside from playing for Arsenal he also played over 600 first class cricket matches and was later reserve team coach at Tottenham. 25 February 1893: As their existence came to an end Royal Arsenal started to play friendly matches against league clubs such as Walsall Town Swifts – in this case in front of 4000 fans. 25 February 1897: Tottenham 2 Arsenal 2. One of a sequence of six Arsenal Tottenham games in the United League following the end of friendlies in April 1896. 25 February 1899: First match under Arthur Kennedy. He was finance secretary of the club but filled in as manager after Elcoat resigned mid-season. Sadly he was not recognised as an Arsenal manager by Arsenal.com last time we checked but is included in the Arsenal History Society list of managers. 25 February 1905 Arsenal 3 Sheffield W 0 concluded the first ever three match winning run in 1st division, but marked the last win until the last day of the season on 22 April. 25 February 1911: Harry Logan played for Woolwich Arsenal 11 times but was only on the winning side once – in the game this day which ended Arsenal 3 Nottingham Forest 2. 25 February 1918: All butchers’ shops were ordered to be open only four days a week as meat rationing was introduced in the UK. 25 February 1919: West Ham lodged their anticipated application to be members of Division II for the 1919/20 season, and started canvassing clubs and the media in the way Tottenham had been doing with its application to stay in the First Division. 25 February 1928: Leicester 3 Arsenal 2. Four defeats and two draws in six saw Arsenal tumble down the league and hope instead for cup glory. Hoar and Buchan scored. 25 February 1933: After four successive draws Arsenal signalled their intent on winning the league by beating Blackburn 8-0. (Coleman 3, Hulme 2, Bastin 2, and Stockill got the goals. Arsenal wore their new kit for the first time but only 27,576 turned up to see it. See also here. 25 February 1939: Last match for Wilf Copping. He returned to Leeds from whom Arsenal had bought him, for 12 last league games. He had made 166 league appearances, won the league twice and the FA Cup with Arsenal. Arsenal lost 2-1 to Preston. 25 February 1961 This was in effect the start of the season’s collapse – in the 12 games to April 29, Arsenal won just two. George Swindin struggled on for one more year before leaving. 25 February 1978: WHU 2 Arsenal 2 made it no wins in four league games. 25 February 1987: Oxford U 0 Arsenal 0. The first of six consecutive league games under George Graham in which Arsenal failed to score – the longest such run ever for the club. 25 February 1998: Crystal Palace 1 Arsenal 2 (Cup 5th round replay on the way to the second Double). Anelka and Bergkamp scored but only 15,674 turned up. The second double: part 1, part 2, part 3. 25 February 2001: Man U 6 Arsenal 1. An Arsenal team with a makeshift defence fell apart in this match after holding the score to 1-1 on 25 minutes, but recovered enough eventually to be runners up in both the League and the FA Cup. It was reported that for once Arsène Wenger lost his temper with his players. Henry Bergkamp and Vieira all played. 25 February 2006: Blackburn 1 Arsenal 0 making it four defeats, one win and one draw in last six, one of Arsène Wenger’s worst runs. 25 February 2015: Arsenal 1 Monaco 3 in the Champions League. Much was made of Arsenal’s failure and Giroud’s poor form in this match, and many critics used this single game as evidence of the poverty of Arsenal’s team which won three FA Cups in four years. 25 February 2007: Arsenal 1 Chelsea 2, League Cup final; Walcott scored his first goal for Arsenal in a game that went on for 103 minutes. 26 February 1887: After a goal total of 39 goals in their first seven games since formation, Royal Arsenal had their first ever 0-0 draw against 2nd Rifle Brigade. They were clearly a strong team as a month later they beat Arsenal in the return leg. 26 February 1916: Arsenal drew 1-1 away to Clapton Orient. In the wartime leagues players could play for any club they wished and Andy Ducat of Aston Villa (previously Arsenal) regularly played for Arsenal – but this was his last appearance of the season. The game also saw an appearance from Caddick of Bristol Rovers. 26 February 1921: Alex Graham’s one and only international debut (quoted elsewhere as 1920). He played 166 games for Arsenal but his career was interrupted by the war. 26 February 1927: Arsenal 6 Burnley 2. It was the last victory for a while as Arsenal then suffered six consecutive defeats in which the club let in 26 goals. Brain got four, Buchan and Hoar got the other goals. 26 February 1949: Arsenal 5 Bolton 0, making 13 goals in three games, and 18 in the last five. Logie (2), Lewis, Valence, McPhearson scored. But a run of seven without a victory in March ended hopes of the title. 26 February 1966: With Billy Wright’s time at Arsenal coming to an end Joe Baker was sold to Nottingham Forest for £65,000. Having played 144 times for Arsenal and scored 93 (a fantastic return for a striker) he then played for Forest 188 times and scored 41 goals. 26 February 1972: Derby 2 Arsenal 2 FA Cup 5th round. Charlie George got both goals and after two replays Arsenal progressed and made it ultimately to the final. 26 February 1979: Nottingham Forest 0 Arsenal 1. FA Cup. Stapleton scored. It was Arsenal’s 7th FA Cup match of the season, but the club was still only at round 5. 26 February 1983: Pat Jennings became first player to play 1000 first class games in a 0-0 away draw with West Bromwich Albion. 26 February 1983: John Kay debut. He only played 13 league games for Arsenal but later had significant success with Sunderland. It finished WBA 0 Arsenal 0. 26 February 1984: Emmanuel Adebayor born. He spent his youth playing in Togo, before moving on to Metz where he played 44 times and scored 15 in the league. Arsenal purchased him in 2006 for £2m and he scored 46 goals in 104 games. 26 February 1986: Tony Woodcock’s 42nd and last England game. He scored 56 goals in 131 league games for Arsenal. 26 February 2004: Jermaine Brown released without playing for Arsenal and later played a few games for Margate and Chelmsford for whom he signed in 2011. 26 February 2012: Rosicky scored his first goal in two years to mark his comeback as Arsenal beat Tottenham 5-2. Tottenham went 2-0 up, with goals from Saha and Adebayor. Sagna and RVP brought it level at half time. Rosicky got his and Walcott got two. There were six bookings and a red card for Parker. 27 February 1897: Arsenal played Millwall, their closest rivals, in the United League. The crowd was 15,000, the highest recorded for a United League game. Arsenal won 3-1. 27 February 1915: Arsenal lost at home to high flying Derby 1-2. At half time the Islington Recruiting Committee (with Arsenal directors’ compliance) were active pushing the case for more volunteers. For Arsenal the only good news was the crowd: 18,000. On the same day a platoon of the Footballers’ Battalion that Henry Norris had funded, marched around the pitch at Craven Cottage. 27 February 1926: First senior game for Andrew Neil. He had played for Kilmarnock, Galston, Stevenston United, and Brighton and Hove Albion before moving to Arsenal on March 13 for £3000. He played 54 times before Arsenal brought in Alex James. 27 February 1926: William Harper made his Scottish debut. Arsenal broke the record transfer fee for a goalkeeper to bring him in – paying £4000. Despite the fee Harper was dropped by Arsenal after 20 matches although he did get the minor consolation of winning a London Combination League Winner’s medal. 27 February 1932: Huddersfield’s largest ever crowd 67,037 saw Arsenal win in the FA Cup 6th round tie 1-0. Over 100 fans were treated for injuries due to poor to non-existent crowd control. Herbie Roberts scored. 27 February 1954: Tottenham 3 Arsenal 0. It was part of a four match sequence without a win as Arsenal slumped to 12th – although not below Tottenham who finished 16th. 27 February 1971: Derby 2 Arsenal 0. League match 29 of the first Double season. Three defeats in the last five games cast major doubts over Arsenal’s attempt to win the league with Arsenal seven points behind Leeds but two games in hand. 27 February 1986: Pat Beasley, one of Chapman’s signings, died. He played 79 times for Arsenal in the league, and then moved on to Huddersfield, Fulham and Bristol City. After finishing playing he had managed Bristol City, Birmingham City and Dover. 27 February 1991: Shrewsbury 0 Arsenal 1 in the FA Cup. Mickey Thomas scored the only goal of the game, 12,536 in the crowd. It was Arsenal’s sixth FA Cup match of the season, but they were still only in the 5th round. 27 February 2002: Arsenal 4 Bayer Leverkusen 1, leaving Arsenal needing to win at least one of their last two group games to progress further. Pires, Henry, Vieira and Bergkamp scored. 27 February 2010: Ramsey was seriously assaulted by Shawcross on the pitch causing a double fracture of Ramsey’s lower right leg, breaking the tibia and fibula. He did not play against until 23 November when he played in a reserve game. Shawcross was immediately given a place in the England squad and at subsequent games large numbers of Stoke fans booed Ramsey, something the club did nothing to counter. 27 February 2010: Jay Emmanuel Thomas loaned to Doncaster but it was not until 2013 that he fully realised his goalscoring potential, playing for Bristol City before later moving on to QPR. 27 February 2011: Arsenal 1 Birmingham 2. League Cup final. The referee was Mike Dean. RVP scored Arsenal’s goal and Birmingham’s second came from a mix up between Szczęsny and Laurent Koscielny. 28 February 1903: Last game for Fergus Hunt. Having been Woolwich Arsenal’s top scorer between 1897 and 1900 he moved on to West Ham before returning for three games in 1903 before moving on to Fulham. 28 February 1908: Tim Coleman sold to Everton. He had played 172 games in the league for Woolwich Arsenal scoring 79 league goals. He later played for Sunderland, Fulham, and Nottingham Forest. After the war he played some non-league football, and then worked as manager for Maidstone Utd., before moving to the Netherlands. 28 February 1913: the Kentish Independent published Norris’ response to the paper’s suggestions that Woolwich Arsenal were on the move saying that if the directors of Woolwich Arsenal were to move the club to a more populated area of London they could scarcely be blamed for doing so with gates at the Manor Ground as low as they were. 28 February 1914: Arsenal played Blackpool. It is very likely that the photo used by Arsenal as the basis for their change of shirts in the final season at Highbury was taken on this date. 28 February 1920: Arsenal beat Man U 1-0 with an approach that The Times described as including “a few bold experiments” including playing defender Bradshaw as a centre-forward and putting a completely untried pairing on the left wing. This was perhaps the first match at Highbury the Times sent a man to since the 1914/15 season when their man noted the exceptionally poor crowd, while seemingly failing to realise he was watching a reserve match. 28 February 1925: Tottenham 2 Arsenal 0; the sixth consecutive league defeat and Knighton’s final derby. The run left Arsenal in 19th out of 22, and an immediate improvement was needed to avoid relegation. 28 February 1931: West Ham 2 Arsenal 4, making it 32 league goals in 7 league games for the club and 14 in the last three. Jack (2), John and Bastin scored as Arsenal headed towards an all time record points total. 28 February 1931: Sir Oswald Mosley resigned from the Labour Party and set up the New Party. “We challenge the 50-year-old system of free trade which exposes industry in the home market to the chaos of world conditions, such as price fluctuations, dumping and competition of sweated labour,” he announced. 28 February 1953: Arsenal 1 Blackpool 2. FA Cup 6th round. Having lost to Blackpool the week before in the League, Logie scored in front of 69,158 people at Highbury but Arsenal went out of the Cup. 28 February 1959: Arsenal 3 Man U 2, Arsenal made it six wins and two draws in eight. The result left Arsenal one point clear at the top of the table, with Man U in third, but the teams below had games in hand. Barnwell (2) and Herd got the goals. 28 February 1964: John Radford became a pro at Highbury. He went on to play 475 league games for the club. 28 February 1970: Final game for David Court. He went to Luton Town but returned to Arsenal in 1996 as Assistant Head of Youth Development. 28 February 1973: WBA 1 Arsenal 0. It was Arsenal’s first defeat in 12 games, and left Arsenal second to Liverpool on goal difference, but Liverpool had played one game fewer. 28 February 1976: Middlesbrough 0 Arsenal 1. This gave Arsenal three 1-0 wins in a row, including the only back to back wins all season to alleviate the relegation worries. Radford scored. 28 February 1978: Arsenal 0 Norwich 0. The last of five games without a win. Only 23,506 turned up to watch. 28 February 1981: Steve Walford’s last game for Arsenal. He went on to play 93 times for Norwich before moving on to West Ham. He later went on to work alongside Martin O’Neill as managerial assistant at various clubs and for Ireland. 28 February 1999: Newcastle 1 Arsenal 1. The draw left Arsenal 12 points behind Man U. Anelka scored. Results picked up but Arsenal still ended second although only one point behind. 28 February 2004: Arsenal went two up in four minutes through goals from Pires and Henry but then hung on to win 2-1 against Charlton making it five wins out of five. The 27th league game of the unbeaten season. 28 February 2009: Arsenal 0 Fulham 0 made it five draws (four of them 0-0) in a row. 28 February 2010: Sanchez Watt’s loan with Southend expired after just four games and despite his early promise the future looked dim. He was moved onto Leeds and after a series of loans settled at Colchester Utd before playing in India. 29 February 1904: Arsenal 4 Burnley 0. Tommy Shanks scored a hat trick. It was the second match of a five game winning run in the league. The result left Arsenal in second position, five points behind Preston but with a better goal average and two games in hand. 29 February 1924: James Ramsay joined Arsenal from Kilmarnock with whom he had won the Scottish Cup. His fee was certainly over £1000 – another example of how Knighton’s memoirs misled the public as to the restrictions placed on him by Henry Norris. Ramsa played 75 times and scored 11 goals. 29 February 1936: Arsenal 4 Barnsley 1 – FA Cup round 6, in front of 60,420 as Arsenal progressed to the semi-final. Beasley (2), Bowden and Bastin (pen) supplied the goals. 29 February 1972: Derby 0 Arsenal 0 after extra time. FA Cup 5th round replay, played in front of 63,077 as Arsenal attempted to retain the FA Cup. 29 February 1992: Barnet 0 Arsenal 6; a friendly arranged after Arsenal were knocked out of the FA Cup. Goals from Parlour, Wright, Campbell (2), Limpar, Smith. Crowd 4484. Pal Lydersen made his debut.